Rather than providing mere file diffs, Imagix 4D's Delta Analysis compares revisions of source code at the structural level. Whether you're looking at different file revisions managed by a source control system, separate bodies of source code kept in parallel directory structures, or the same exact code compiled with different compile options, the functionality of Delta Analysis enables you to understand the impact of the source code differences at the level they are meaningful - in the control flow and overall architecture of your software. 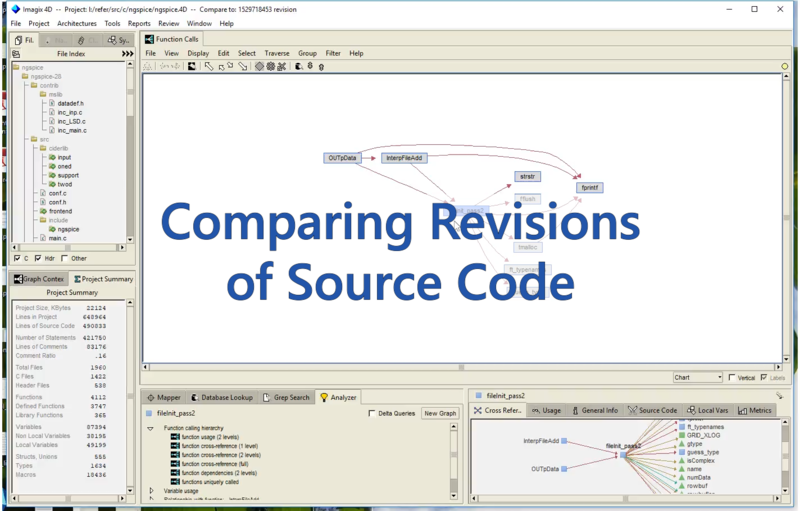 After a brief introduction to the concepts of Delta Analysis, this video provides a technical demonstration of using the tool to compare revisions of source code. The demo project is an open-source mixed-level/mixed-signal circuit simulator, written in C.